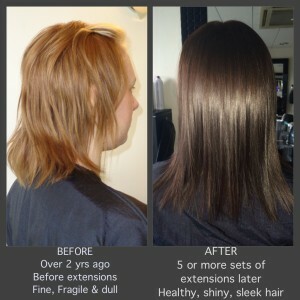 So you want THICKER, FULLER, LONGER hair but your concerned about the effects extensions will have on your own hair. We’re hair extension experts at Caprio’s Hair Studio in Kingswinford– We’re an Award winning Salon for our expertise , experience and high standard in hair extensions. Recently we won Great Lengths ‘SILVER SALON OF THE YEAR for OUTSTANDING PERFORMANCE’ in hair extensions. One of the first things we get asked by those of you thinking of having extensions for the first time is ….’will they ruin my own hair?’…..the answer is no!……….We’ve been transforming ladies hair for years now and providing you look after them and you follow the after care rules, your hair will be fine after the extensions have been removed. I thought I’d share this picture with you, this lady has had 5 or more sets of Great Lengths extensions in over the last couple of years. 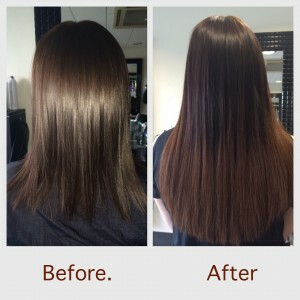 She hasn’t had a break in between, which we would normally recommend, which means as one set of extensions are removed another set is applied the same day. As you can see from the picture her hair is healthy, shiny, sleek and a lot more appealing than it was before she had extensions. Even though her hair is in much better condition now, in fact it’s so soft and silky it just slips through her fingers, she can’t live without Great Lengths. Her hair is fine and doesn’t grow very long before it has to be cut short again to thicken it up. Great Lengths extensions give her the hair she always dreamed of, thicker, longer and full of volume. With each set she can vary the colour by either adding warmer, lighter, darker tones or like the other images showing her latest set of extensions, she can have a stunning Ombre effect without having to have the chemical process of lifting the colour out. We achieve this by applying Great Lengths Flow Strands. ….So you see, providing the extensions are applied by an expert, you follow the aftercare instructions and visit the salon regularly your own hair will be healthy after extensions. Although there is one warning………..you may become addicted to having longer, thicker, luscious, bouncier hair, but hey…..who wouldn’t?!? !